This festive season, take the stress out of organising the Christmas party and leave it to this excellent London venue, who will create a fantastic exclusive celebration for you and your team! This Grade Two Listed venue of modern opulence is incredible and offers some truly stunning Victorian glamour that really packs the wow-factor. 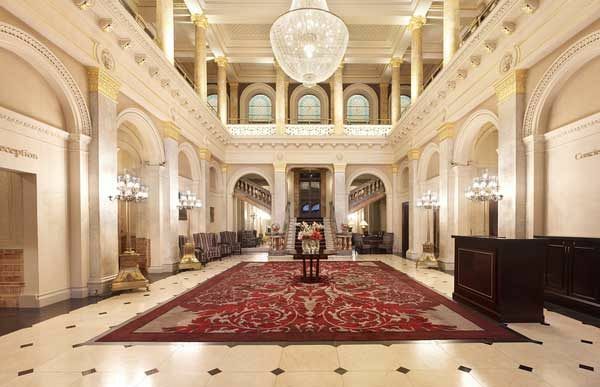 Admire the spectacular chandeliers, lavish staircases and striking moulded ceilings. With this excellent Bronze party package, party guests will enjoy a delicious glass of chilled bubbly on arrival to the event, before taking a seat for a mouth-watering three course festive feast. The menu is simply sumptuous, and you’ll be spoiled for choice with the fantastic array that’s on offer. If you’re a vegetarian then don’t worry, because there’s some brilliant meat-free alternative available. A half-bottle of wine and a half-bottle of mineral water will be provided for each guest, along with Christmas table decorations. Mini mince pies will be served after dessert in true festive tradition and to conclude the dining experience. As the evening continues, you’ll enjoy a shared DJ and disco where you’ll join other exclusive parties as they celebrate the best of the festive season! Get ready to party the night away and round off a long working year in style at this grand venue in the heart of London. Prices start at just £49.17 per person excluding VAT for Saturday - Tuesday dates and £57.50 per person excluding VAT for Wednesday - Friday dates. Send an enquiry through today and secure your preferred party date!